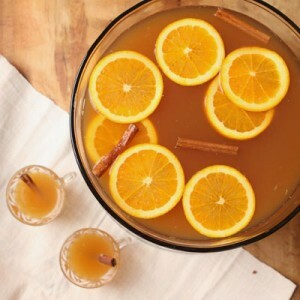 Combine the New Deal Ginger Liqueur, ciders, whiskey, lemon juice, and bitters in a large punch bowl or pitcher. Stir to combine. Top with orange slices and cinnamon sticks. Ladle into ice-filled punch glasses. Recipe adapted from Saveur’s Chilled Cider Punch.